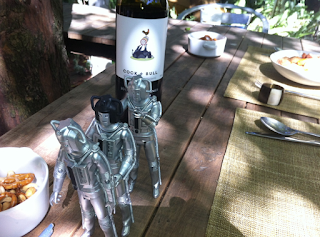 My toy cybermen about to eliminate my lunch. 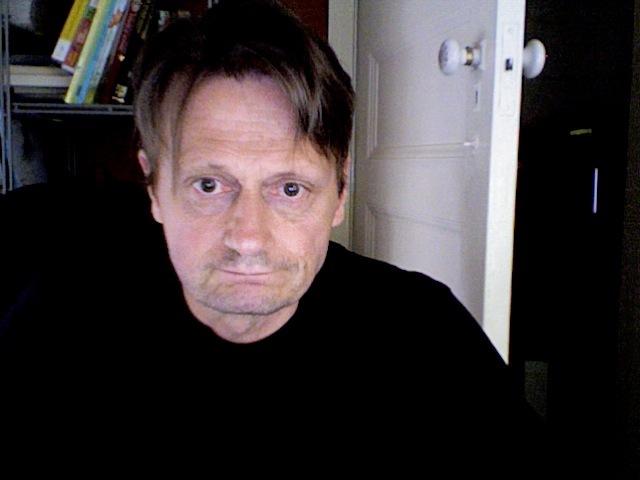 I notice I’ve been more or less avoiding the subject of writing when posting on this blog. I always feel guilty spending time writing on the blog when I don’t have a current writing project to which I can devote myself. 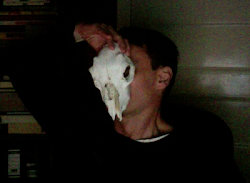 And f course, I’m self-employed, so there should always be projects to which I can devote myself. That situation hasn’t changed. Yesterday I walked into the big converted warehouse, now called home by my publisher with an identity crisis, Random House Penguin Pearson. I dropped in my latest manuscript, with a covering letter to head-of-publishing-for-young-adults, Laura Harris. The letter explained that I’m unsure about the manuscript, even though Laura has already read an earlier draft and claims to be a fan. When I started this blog I was virtually unknown as a writer of YA books, though I had good TV creds. Since then, my last two books (The Life of a Teenage Body-snatcher and The Shiny Guys) have appeared on a few shortlists and books in my backlist are getting some attention, which is very gratifying. People are writing nice things on Goodreads about I’m Being Stalked by a Moonshadow, The Clockwork Forest and Siggy and Amber. So, yes, I’ve started self-googling, and I haven’t found anything too toxic so far. People are more likely to be insulting and damning about my TV work. For my book work I’ve been called Gaimanesque once or twice, which is a sweet compliment. I saw Neil Gaiman when he last appeared at The Atheneum Theatre in January, 2013. It was more like a rock concert than a ‘reading’. Though he did read very well. It was an excerpt from his latest book, The Ocean at the End of the Lane. Neil is the god of geek chic and I felt out of place, there in the Atheneum five rows from the front, dressed in my St Kilda black and not wearing a Doctor Who teeshirt, which seems the latest must-have fashion statement in geekdom. I haven't even read Sandman, for Christ'ssake. Me in my St Kilda black, probably not looking all that out of place at a Gaiman event. I actually did once own a Doctor Who teeshirt, way back when Tom Baker was the timelord and the show was remarkably good. I’m not sure if I ever wore it. 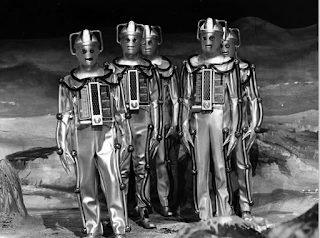 And I must have something of the geek about me because my friend Robert went to great effort when last in London to get me some toy cybermen from the famous science fiction shop, Forbidden Planet , where the first signings of The Hitchhiker’s Guide to the Galaxy took place. 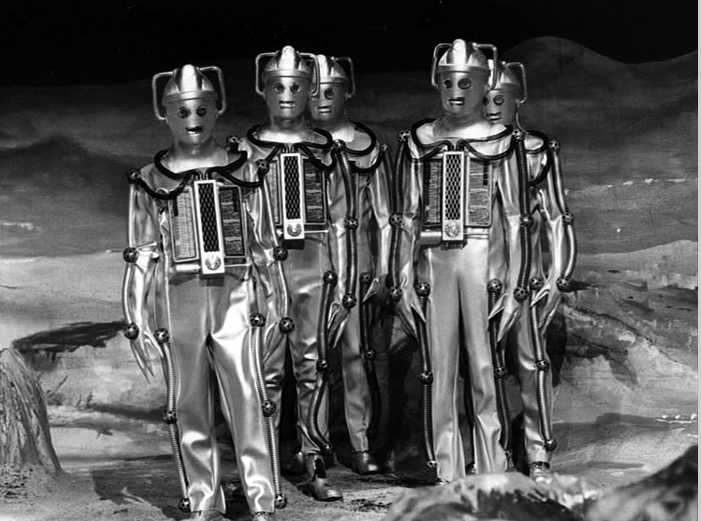 The next cybermen story in Doctor Who is to be written by Neil Gaiman. The fans hold out high hopes. Gaiman spoiled us rotten with his story The Doctor’s Wife, which is treated as reverently as the fantastic Blink episode that Steven Moffat wrote, where we were all terrified by weeping stone angels that could ‘get you’ merely by looking at you, if you blinked. 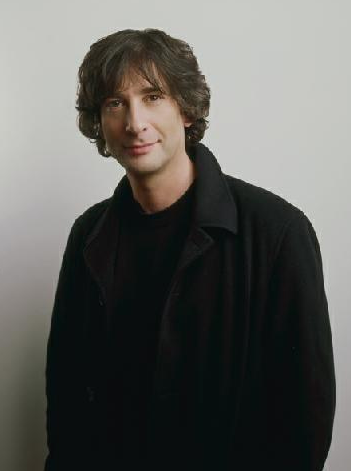 Neil Gaiman not blinking and also looking very St Kilda. TV producer Tony Cavanaugh once had the good taste to plan a drama series built around Shaun Micallef as an amateur sleuth. I like Shaun and it was a pleasure to workshop some story ideas with Shaun, Tony and also, for some reason, Craig McLachlan. I’m not sure if Craig was to be involved but he was his usual larrikin self, and provided a nice foil for Shaun’s more cerebral sense of humour. I was contracted to write the pilot episode, which was to be a telemovie. It was to be called The Crime Show, a deliberately prosaic title that Shaun perversely liked for that very reason. It was pleasant writing for Tony. He took me to nice restaurants and showed me his boat and his amazing house on the river in Noosa. In an effort to get my head around the whole crime genre, I read as much crime fiction as I could, and started developing a real respect for the writer Robert Crais, who plotted his books so well that I forgave him for overusing certain words, such as ‘perp’. Though when I learned about this piece of police jargon, I also gave the word a bit of a hammering in my telemovie script. I tried to include all the stuff we had talked about in the writing workshops, but still the script seemed less than the requisite two hours running time. So I added big physical comedy moments for Shaun’s character and also for his offsider, who would be played, I was told, by Rebecca Gibney. The script took me a few weeks to finish. I was pretty happy with it. We had a reading with Shaun, who laughed in the right places. Shaun has very definite ideas about what is funny and what isn’t, and he's usually right. I trust Shaun’s judgment thoroughly. I was once the creative producer of a TV sketch comedy series called Full Frontal. We used to show all our material – recorded and live – to a studio audience on Friday night. Often I didn’t have a full live night. THere would be some time to fill, or the show might run short. On Thursday afternoon I would ring Shaun and ask him, basically, ‘What have you got? I’ll do it.’ I mention this because Shaun has been telling a story lately about how I apparently rejected all thirty of the sketches that he submitted to me on his first week as a Full Frontal writer. And he’s been saying that the first series of his fantastic ABC show consisted mainly of sketches that I’d rejected from Full Frontal. I also produced the ABC series and I know for a fact that this is untrue. But I was the gatekeeper on Full Frontal and I had a terrible reputation for sending sketches back to writers if I thought they needed more work or weren’t funny enough. I don’t recall much about those thirty sketches that I had apparently rejected on submission from Shaun, but I do recall a few of them were about the movie Greystoke, which was old then. I just couldn’t see the Full Frontal audience getting excited about a parody of a movie that had come out five years ago, and that they quite likely didn’t see because it was arthouse and Adam Sandler wasn’t in it. Anyway, the fact that Shaun laughed at a few of the lines in my script was encouraging. Coincidentally, a TV series where Shaun plays an amateur sleuth is being masde for Channel Ten this year. Pure coicidence, as I say. I was at some of the writers meetings for it. But I found that trying to write crime fiction when you’ve had a stroke is about as sensible as bungy-jumping when your retinas are slightly detached. I bowed out as gracefully as possible (not very, when you've had a stroke) and I hope no one was too pissed off. I think it will be a good show. Meanwhile, my TV movie script for The Crime Show was handed around to various readers for their thoughts. Themost constructive feedback I got was from Mike Bullen, the English writer who penned the funny and arresting TV drama series Cold Feet. Mike Bullen was pretty damning about my work. He said that the story simply wasn’t interesting enough. There were some good hero scenes and plenty of jokey dialogue – but that simply wasn’t enough to keep a viewer committed. And Mike was right, of course. The script I’d written was formulaic, based on other people’s stories and books I had read. It wasn’t gripping like Breaking Bad, a show with clever plotting that kept me rivetted for four series. Breaking Bad was always interesting. two hours of telly ever penned. It didn’t go ahead, which might have been a blessing, or we might have fixed up the ‘lack of interest’ problem as we produced the show, but that hardly ever happens. Which brings me all the way back to the manuscript I submitted to Penguin this week. We’ll call it Bondi Tigers. There’s no fantasy in it, no clockwork forests that eat people, or grave-robbers with impeccable manners. It’s my usual boy meets girl, boy loses girl, boy gets girl back plot. And I confess I’m worried that someone might notice I’ve written this book twice already. It’s basically the plot of I’m Being Stalked by a Moonshadow and also Siggy and Amber. You just hope that the comedy and new characters (although even some of those are left over from Siggy and Amber)will be enough to keep the reader beguiled – and there really are an awful lot of jokes. That’s a criticism that I’m sure will be levelled at the book, that it’s far too flippant. I’d argue that one of the themes of the book is how comedy both unites and divides us. It’s the only subject about which I feel I can write with any authority. But is that interesting enough? With The Shiny Guys I got tired of making gags and decided to take the world seriously for once. I was surprised that people warmed to it as much as they did. Maybe it was interesting? I did a fair bit of research to write it, even having a psychiatric nurse show me the ECT machine in his ward and how it worked. I wasn’t going to use the Ken Kesey ‘Cuckoo’s nest’ rendition of the ECT machine sequence, because I knew that was heavily biased and basically wrong. Besides, it also belonged to someone else. Robert McKee is something of a legend in filmwriting circles. He wrote a book called Story, which is a sort of bible for scriptwriters. Many consult it when they are stuck with a story that isn’tr working. McKee is so famous he even appears as a character in Charles Kaufmann’s quirky movie Adaptation. McKee writes that one should never start writing a script until the research has been done and an interesting story has been envisaged. So far, most of the research I have done for my novels has been a sort of strip-mining operation, where I recycle parts of my own teen life and turn them into novels. But is this interesting enough? There are at least two ourtrageous scenes in Bondi Tigers which occurred in my own life. One of them involves an explosion. Reader, I’m not asbsolutely sure I’m going to get away with it this time. I’ll keep you posted, and just hope that the good people at Penguin Random House Pearson Insert Name don’t read my blog. It's hard not to like these guys, which are almost as cool as the anonymous commenter who thinks I might just be interesting enough. We were burgled over Christmas. They got my computer, an old iMac. Of all the things in the house this was the most valuable to me. I’d backed up most of the important documents, such as a couple of manuscripts for novels (both in first or second draft – a long way off my daring to submit to publishers). Friends helped me out, producing some soft copies of my work that I had sent them for one reason or another. There were a few photos I would have preferred not to lose. The burglary was committed so quickly, while we were away looking at the giant stinking corpse lily (see above, and she really doesn't smell that bad)at the Botanical Gardens. I was sure the burglar must have been close by, so I started roaming the backstreets of St Kilda, looking for suspicious people. The trouble is, everyone in St Kilda looks suspicious, so I decided to narrow it down to suspicious people carrying or stashing my computer. As I walked through likely thief haunts (I didn’t even discount the children’s adventure playground) I had my hand wrapped around a roll of twenties. All I wanted to do was buy the computer back from the thief. The stuff on the hard drive was priceless to me, but absolutely worthless to anyone else. It seems the most miserable act of theft is stealing someone’s computer. When the extremely funny comic author David Sedaris was in Melbourne last year, he spoke about a writer’s feeling of despair after having a computer stolen, finishing his speech with a casual, ‘I would never steal anyone’s computer,’ as if he would be prepared to commit other acts of theft but not that one. 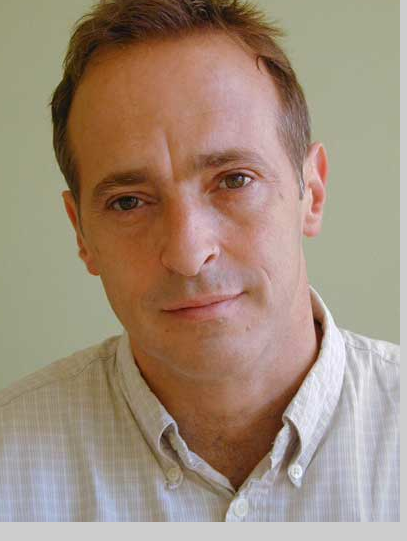 The brilliant David Sedaris, who would apparently never steal a computer. Yesterday morning we did the rounds of all the pawnbrokers on a list provided by St Kilda police. They’re very careful about this list. It is not intended to be incriminating. No one is implying that cash Converters is little more than a fence for stolen goods. Actually, I take that back. I am implying that half the stuff at Cash Converters seems nicked. I had a chat with a staffer at the Chapel Street store, who told me what precautions were in place so that they would never fence stolen goods. None of these precautions seemed terribly reassuring. The staffer pointed to all the security cameras, which I suspect were more about stopping shoplifters from nicking the booty from their shelves, than identifying dodgy sellers. Apparently, the sellers always have to provide photo ID, and we all know how difficult that is. When I was a student at the Victorian College of Arts, and our student cards were issued, my friend Chrissy Best managed to organise a student card for her dog as well. She also got an extra one for herself wearing clown makeup, just in case she happened to be a clown when she was required to produce photo identification. I have it on good authority that the student security I.D. process is now a little tighter at VCA, now part of the Univerity of Melbourne, which is why I now get the Melbourne University magazine. They can keep sending it, it makes me feel smarter. Perhaps there's a huge market for Elvis figurines and I'm wrong to turn up my nose at them? We were actually lucky. The burglars didn’t do any damage to the fortress in which we live. THere was a burglarey around the corner where the thieves thought it might be a good idea to start a fire. They starte it in the bedroom of one of the teen kids. This seems to me to make the crime more despiccable. When you're a teen, stuff matters. I don't know if the burglars were trying to make some point, or they were just complete bastards. 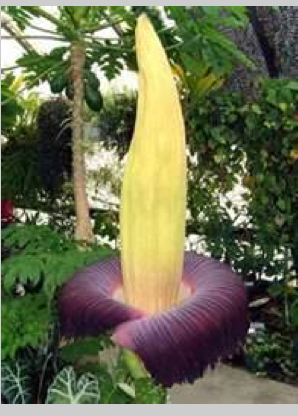 I’ll never look at a giant stinking corpse lily again without a sense of being robbed.